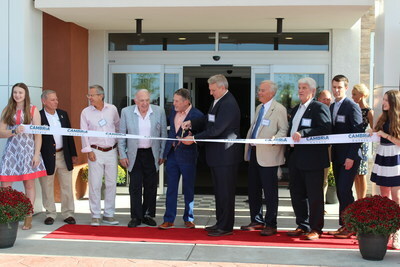 ROCKVILLE, Md., Sept. 14, 2018 /PRNewswire/ -- On the heels of record tourism growth in Indianapolis, the Cambria Hotels brand debuted its second hotel in the area with the grand opening of the Cambria Hotel Westfield. Located at 18592 Carousel Lane, the 152-room upscale hotel highlights the brand's continued expansion in key U.S. markets. "Indianapolis boasts a diversified economic landscape anchored by the health care, education, and financial sectors, as well as a tourism industry that has experienced six-straight years of growth. The Cambria Hotel Westfield is the ideal location for business and leisure travelers looking to maximize their time and take advantage of all that the city has to offer," said Janis Cannon, senior vice president, upscale brands, Choice Hotels. "We know guests visiting Indianapolis will enjoy a sense of place and a sense of space at this hotel with all of the little luxuries modern travelers look forward to when on the road." The upscale property is a part of the Westfield Grand Park Village, directly across from Westfield's Grand Park Sports Campus. The hotel is a short drive from downtown Indianapolis, offering guests access to many of the city's corporate offices and major attractions, including the Indianapolis Convention Center, National Collegiate Athletic Association, the Klipsch Music Center, and the Indianapolis Motor Speedway, home to NASCAR's iconic Indy 500. The city, with a rich history in professional and collegiate athletics, will host the NBA All Star Weekend and the National College Football Championship Game in coming years. The Cambria Hotels brand is franchised by Choice Hotels International, Inc. (NYSE: CHH), one of the largest and most successful lodging franchisors in the world. The Cambria Hotel Westfield was developed in collaboration with Ceres Enterprises and The Orlean Company. "Guests love the Cambria product, which is uniquely designed with modern amenities and locally-curated details to exceed the expectations of travelers," said David Crisafi, president of Ceres Enterprises. "We've enjoyed working with Choice Hotels to develop and open several other Cambria properties in Minnesota, Indiana, and Ohio, and cannot wait for guests visiting the Indianapolis area to experience another great Cambria hotel." "Time and time again Cambria Hotels delivers a great experience for guests, and the Cambria Hotel Westfield is another example of that. Westfield's growth in the greater Indianapolis area with many attractions and top businesses make this hotel the perfect fit for both leisure and business travelers," said David Orlean, president, Orlean Company. Choice Hotels International, Inc. (NYSE: CHH) is one of the largest and most successful lodging franchisors in the world. With more than 6,800 hotels, representing more than 550,000 rooms, in over 40 countries and territories as of June 30, 2018, the Choice® family of hotel brands provide business and leisure travelers with a range of high-quality lodging options from limited service to full-service hotels in the upscale, midscale, extended-stay and economy segments. The award-winning Choice Privileges loyalty program offers members benefits ranging from everyday rewards to exceptional experiences. For more information, visit www.choicehotels.com. Ceres Enterprises, LLC, owns and operates fine hotels. It is family owned and managed by Frank Crisafi, CEO, and his son, David Crisafi, President. Both have extensive and successful careers in hotel and real estate development and they have each earned their Law Degrees from Cleveland State University and the University of Virginia, respectively. Working with the premier franchises of the hotel industry, Marriott, Hilton, and Choice, they have developed a market-dominating portfolio in the Cleveland and Troy, Ohio markets, as well as in Noblesville, IN. Learn more at www.ceresdevelopment.com. Access to a good home is a vital piece of the American Dream. That dream prompted Arthur Orlean to establish The Orlean Company in 1954. He started with the construction of single family homes, built with care. High demand, and the company's reputation for quality, drove steady growth. In the sixties, The Orlean Company expanded into developing and constructing both conventional housing, and HUD-insured multifamily apartments. Since then, The Orlean Company has grown to become a leader in developing residential properties, commercial real estate and rehabilitation projects. Learn more at www.orleanco.com.